John Kerry reportedly maintaining contacts with PA chief Mahmoud Abbas, urged him to 'stay strong', while hinting at 2020 presidential bid. Former Secretary of State John Kerry recently urged Palestinian Authority chairman Mahmoud Abbas to resist President Donald Trump, telling the PA leader to ‘stay strong’ and ‘play for time’ – while suggesting he may make a second bid for the White House. Kerry, who left the State Department last January, has maintained contact with the PA leader via an intermediary, a new report in Hebrew daily Ma’ariv claims. 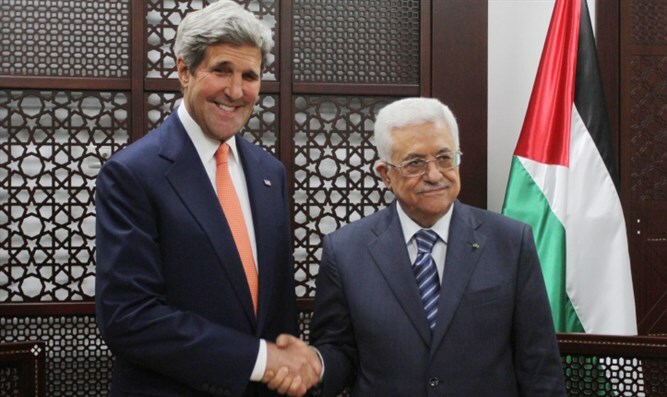 According to the report, which has been confirmed by senior PA officials, Kerry has continued to meet with Hussein Agha, a confidant of PA chairman Mahmoud Abbas who served as an interlocutor for Kerry and the PA leader during Kerry’s four years as America’s top diplomat. During a recent meeting between Kerry and Agha in London, the former Secretary of State and 2004 Democratic presidential nominee reportedly expressed his support for Abbas, asking Agha to convey the message “hold on and be strong” to the PA chief. Kerry also urged Abbas, via Agha, to reject President Donald Trump’s “demands”. The former Secretary of State also suggested the PA formulate its own peace plan. Kerry further offered to help build international support for an alternative peace plan, circumventing the US, which has traditionally played the role of broker in peace talks between Israel and the Arab world. The Massachusetts Democrat even suggested he may run for president again with a bid to unseat President Trump in 2020. Last September, Kerry refused to rule out the possibility of running in 2020, telling MSNBC that he did not “have any plans right now” to run again. If elected, Kerry would be 77 on inauguration day in 2021 – making him the oldest president in US history. The current record is held by President Trump, who was 70 years old when he was sworn in last year.